Stuart Kaye is one of the founding Directors of Adams Kaye, having formerly worked for 9 years at DKLM Solicitors, as Partner and head of the firm’s residential property department. Prior to this, he worked in the tax department at Clifford Chance. Stuart Kaye has an immense passion about his work and will go out of his way to offer his clients a true “hand holding” service. Stuart Kaye is also a self-confessed email addict! Our philosophy is that buying or selling a home should not be stressful, as Stuart Kaye and his team will work closely with you and keep you informed at all stages during the conveyancing process. His portfolio of clients includes first time buyers, City professionals, celebrities, investors and high net worth individuals. Whether you are buying a studio apartment or a £20m property, Stuart Kaye will guarantee the same bespoke and personal service. 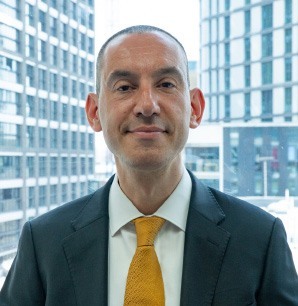 Stuart Kaye is involved with the City of London’s mentoring programmes and workshops, to help and advise students (at all levels) embark on a possible career in law and to help equip them for a life in the office. Stuart Kaye loves his work and is keen to share that passion with others. In his spare time he enjoys walking his dog Barney, travel, theatre and the arts. Prior to becoming a lawyer, his background was in the theatre (but that was a lifetime ago).